What opportunities and challenges did you and/or Nuxeo identify at the start of 2018 and have things worked out as planned? Today’s enterprises spend millions and millions of dollars on Content Marketing strategies, generating an endless stream of content in a variety of forms including photos, videos, etc. This is all in an effort to better attract and serve customers in our new digital world and create a competitive advantage. But while content in its various forms has never been more vital to the needs of the modern marketers and their organizations, it also has never been more difficult to manage. In other words, most large organizations have many different Content Management Systems, but have only succeeded in creating silos in their business that erode the customer experience and make it difficult for them to maintain a singular view of their customer information. These patchwork solutions remain disconnected today because organizations simply feel they have too much invested — and they’re overwhelmed by the thought of having to start from scratch. 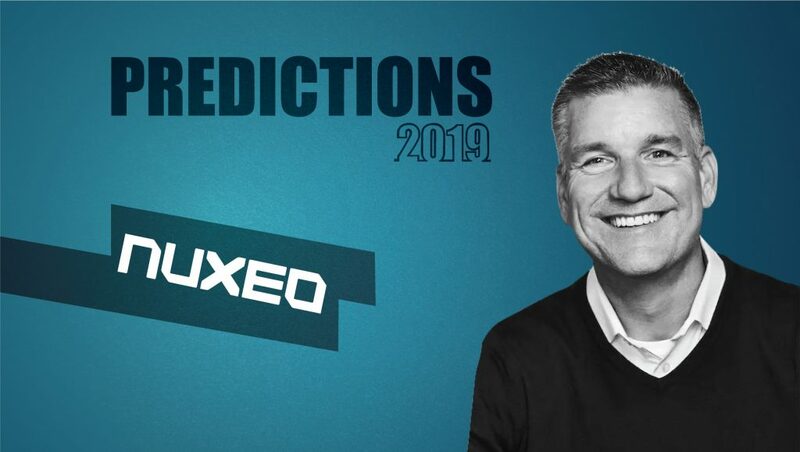 Over the past year, Nuxeo has come a long way helping organizations realize they don’t have to “rip and replace” their legacy systems in order to gain a holistic view of all their customer content and data residing throughout the enterprise. To do so, we have provided a rich federation framework to help our customers connect to these disparate legacy systems. And we use leading machine-learning engines like Google Vision and Amazon Rekognition to intelligently enrich this information, making it easier than ever for our customers to quickly find and effectively manage content, digital assets and other critical customer information. So, as we begin the new year, we believe we’re truly on the cusp of an information revolution. In 2019, we believe that AI will continue to bring new levels of automation and intelligence to the enterprise, while also enabling them to enhance the customer experience. 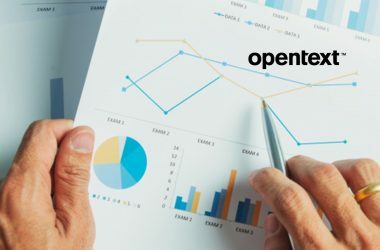 And, the really good news is, we are already seeing customers today invest in our approach for modernizing their information infrastructures to gain a more holistic view of their customers. As someone who has seen ECMs and DAMs grow from close quarters, how do you contribute your expertise to the B2B Marketing and Advertising landscape? First and foremost, I try to be a resource for our customers. Since we have a lot of customers in the digital asset management (DAM) market, we frequently engage with Marketing organizations. Not surprisingly, we share many of the same challenges and obstacles in our businesses, so I often find it is valuable to share the benefits of my experience with content and asset management solutions, like Nuxeo. Also, after almost twenty years in the industry and having worked with both FileNet and Documentum, I’d like to think I am a good resource for customers who are looking to modernize their content technology and move off of some of these legacy systems and onto Nuxeo. I also contribute regularly to our Nuxeo blog, various publications and have mentored a number of up-and-coming B2B marketers. I am not as active on social media as I should be, but it’s a new year and a great time to resolve to get back on LinkedIn and Twitter. What are your predictions on the “Role of Content Verification Tools” in making Marketing Attributions more refined? I don’t know if it’s so much a prediction as it is a simple set of observations. First, good content is the foundation of the modern marketing program. Second, for the modern marketer, more accurate data about your content is always a good thing. With the advent of Content Verification tools, we now have technology that allows us to analyze and better understand how content is being delivered and consumed. This gives us the ability to ensure that targeted content is reaching its intended consumer. It also gives us the ability to tune different delivery channels to make our placements more accurate and to also reduce noise and false traffic. By necessity, this means that our attribution model will be more accurate and we will have a truer understanding of how content is performing across the digital landscape. What do you think about leveraging blockchain technology to handle the recent burst of disruptions in the tech industry? Blockchain is a fascinating topic for me for two reasons. First, I can see the potential of the technology and have witnessed, firsthand, its value in industries like financial services, where security and transparency in financial transactions are absolutely critical. And the immediate use cases are apparent — from stock trading and security transactions to identity management, know your customer (KYC) and anti-money laundering (AML). Second, and this may be a bit more controversial, blockchain also remains a hot technology that is still looking for a compelling value proposition outside of more transactional use cases — the proverbial “hammer looking for nails to pound.” Or perhaps it’s more of a case of when “you have a hammer, everything begins to look like a nail.” Regardless, blockchain got a lot of airplay initially in our market, but the use cases haven’t really materialized. Does it have the potential for file management and file sharing? Sure it does. Does it have applicability for e-commerce. Again, yes, absolutely. Blockchain is, undoubtedly, great technology. But, and this is true of all enterprise software, it also has to deliver value. It has fascinating potential for helping marketers build better relationships with their customers, and it offers several additional layers of both security and transparency. But, I am still looking for the compelling use case that makes it indispensable for MarTech. We make extensive use, today, of AI-as-a-Service. As I touched on previously, we have integrated with both Amazon Rekognition and Google Vision for image and video analysis. We have also integrated with Amazon Comprehend for entity extraction and sentiment analysis. These Machine-Learning (ML) engines provide tremendous value for the Nuxeo Platform and, by extension, our customers. This being said, what we are learning with AI-as-a-Service is that the real value for our customers is in allowing them to train on their own content and create their own customized ML models. Take Google Vision for example. Google Vision does a great job of analyzing a given picture or video and can provide a lot of data and context about what is contained in the image. But, for most enterprises, what they are really interested in understanding is which of their products is represented in the image — which model, which color, etc. By using a customer’s own data set and a custom model, we can take a service, like Google Vision, and turn it into a powerful tool for brand and product recognition. I would add that we are only scratching the surface, thus far, with Artificial Intelligence and content. We see a number of future use cases for AI, from self-determining workflows to predictive delivery of content. This one is fascinating for me, particularly in a marketing context. We don’t make use of services like this today in our product. But the potential in terms of creating and analyzing fit-for-purpose content is really compelling. Fundamentally, as long as content is critical to marketing — which it always has been and will likely always be — I can see real business value for marketers in a Validity-as-a-Service offering. Again, I would think the market would offer generic services for assessing content validity and that the results of these services would improve with additional training and customization for unique businesses and product offerings. What was the most impactful lesson you learned from 2018? How do you plan to implement the lesson in 2019? 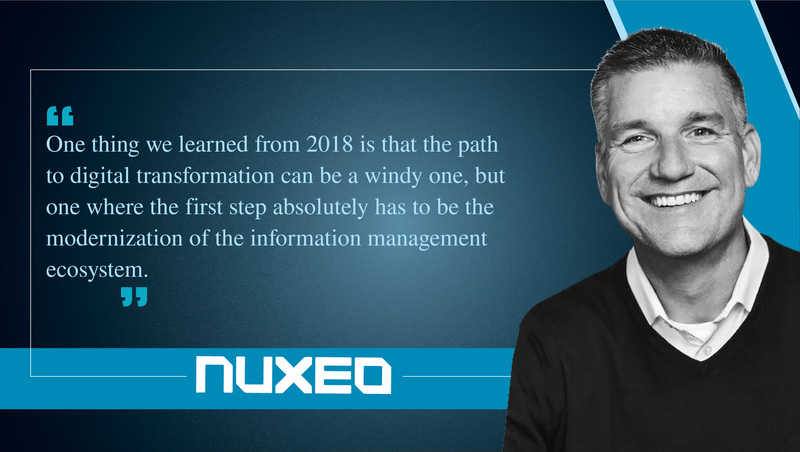 One thing we learned from 2018 is that the path to digital transformation can be a windy one, but one where the first step absolutely has to be the modernization of the information management ecosystem. Get that foundation right and the latter stages of the journey are achievable. Fail to lay this foundation, and don’t be surprised when the whole digital transformation house comes crashing down around you. In 2019, we’ll continue to focus on delivering an intelligent content services platform that enables enterprises to quickly deploy solutions and integrate with business applications, and do so in a manner in which evolves with the needs and demands of their business. In this regard, we’re helping to “future-proof” our customers’ information management landscape by enabling them to replace individual functional components and to continuously evolve and iterate their solutions to meet the changing needs of their customers and the market. Not only is the path windy, it’s also an endless one. Dave Kellogg, the CEO of Host Analytics, is a Nuxeo Board member. 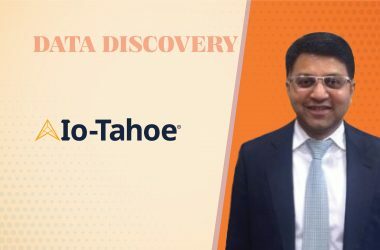 As a former CMO (at Business Objects), Dave is a fantastic resource for me in my role and has offered great insights about analytics and metrics as well as organizational design, programmatic, etc. Outside of Dave, I really value the inputs and insights I get from our customers. As the head of both our Marketing and Product Management functions, it is incredibly valuable for me to engage with customers and learn more about how they work and gain value from our products. Tag a leader in the industry whose predictions you would like to see here. Easy one for me. I am a big “Crossing the Chasm” fan and practitioner. So, Geoffrey Moore is the obvious choice. As CMOs, we are all familiar with the value of content when it comes to marketing and engaging new customers. However, as a company that focuses on creating a competitive advantage from content, we believe that content is everything. Content is how we work. Content is how we create and collaborate. Content delivers compelling customer experiences. Content is how we bring products to market. In many cases, content is your product (think Netflix). My advice is to stop looking at content as a problem to be solved and instead look at it as an opportunity to differentiate and transform your business. Christopher McLaughlin is a Chief Marketing Officer at Nuxeo. He specializes in Marketing Strategy, Product Strategy and Marketing, Field Marketing, Financial Services and Insurance,Partnerships & Alliances. Nuxeo, developer of the leading Content Services Platform, is reinventing enterprise content management (ECM) and digital asset management (DAM). Nuxeo is fundamentally changing how people work with data and content to realize new value from digital information. Its cloud-native platform has been deployed by large enterprises, mid-sized businesses, and government agencies worldwide. Customers like Verizon, Electronic Arts, ABN Amro, and the Department of Defense have used Nuxeo’s technology to transform the way they do business. Founded in 2008, the company is based in New York with offices across the United States, Europe, and Asia.